Every year tens of thousands of gamers descend on the German city of Essen’s huge ‘Messe’ convention centre for its annual celebration of all things board gaming, the Internationale Spieltage – or Essen Spiel to most English speakers. As the biggest board game convention in the world* people travel from across the globe to visit it – many for the first time. If you’re one of them, especially if travelling from the UK, hopefully this run-down will give you some useful tips. By air: Unfortunately Essen doesn’t have an international airport, so unless you intend to fly in by light aircraft you’re going to be looking at arriving in Essen by train. Düsseldorf International Airport is a 40-minute train ride from Essen, with regular flights arriving from Europe (including Birmingham and Manchester). Cologne is also less than an hour by train, with Dortmund about two hours from Essen. By rail: Seeing as you’re going to have to get on a train anyway, another solid option (especially from the UK) is to go via Eurostar. Brussels is just over two hours from London Kings Cross, which has occasional direct trains to Essen and a regular service to Cologne (three to four hours more). 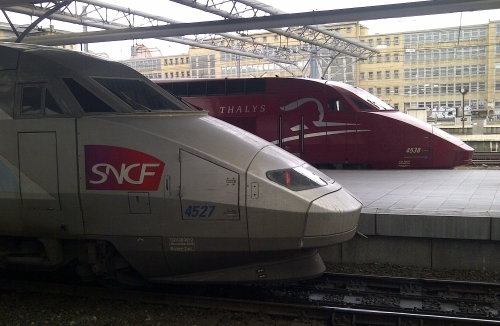 I personally use the SNCF site to book tickets. This is now my chosen mode of transport. While five hours on the train sounds like a lot, you need to remember you don’t have to be at the Eurostar terminal as early and there’s no waiting for luggage as you have it with you – and far fewer luggage restrictions. If you have a few going, you can book a table too – and game all the way! By road: If you intend to pick up so many games that rail or air won’t cut it, or if you simply like driving, jumping in the car is of course an option. You have to be 18 to drive in Germany and (of course) abide by its road regulations but I’m reliably informed that it is an easy country to drive in. This also then gives you the option to stay a little further from the Messe itself, as well as the option to drive to in each day (perfect for those who drag a pallet truck, with pallet, around all day). Parking (5,000 spaces) is just five minutes from the halls, costs five euros, and you can stay as long as you like (pay in cash as you exit). It’s fair to say that while Essen isn’t the most appealing city you’ll visit, it’s very welcoming to the annual invasion of the gaming community. On the plus side the city centre is compact and the railway station is at its heart. 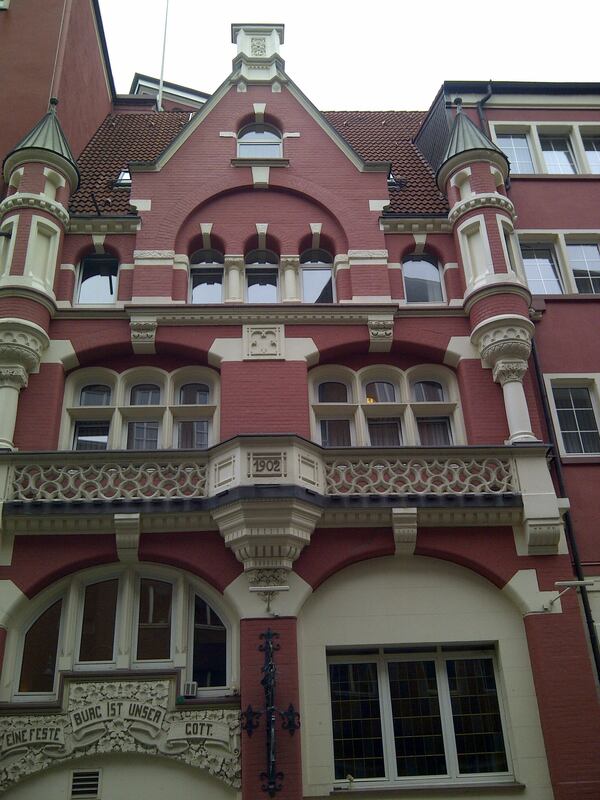 It has a good number of shops and restaurants and an inability to speak German isn’t much of a hurdle. On the downside, it has very little to offer the tourist – this is not a convention I’d suggest bringing a non-gaming spouse to, unless you stay outside of Essen (see below) or book a very good hotel indeed (and they like staying in). But again on the plus side, one of the main roads joining the town centre to the Messe, Ruttenscheider, is now a real hub of bars, cafes and restaurants. From the trendy to the Irish to the traditional, there’s a bar along here for everyone. If you are from the UK and staying in Essen itself, its worth popping into the town’s Toys R Us just to get jealous of the kind of things the average German can expect to find in a normal toy shop! Near the Messe: If you’re just here for the games, have a good budget and get your booking in VERY early indeed, there are several large hotels in close proximity to the Messe itself. You will be a good 30-minute walk from the town centre, but there is a regular metro service (just four stops on the U11) which will get you there in just a few minutes. The Atlantic Congress Hotel is practically on the Messe’s doorstep, while several others are within a very short walking distance (less than 10 minutes). I’m yet to try any of these, but will be in the Mercure Plaza this year (20 minute walk to the Messe). I love a walk in the morning, and it also makes me think twice about buying more than I can carry! You can find an Essen Metro map here. Central Essen: The most common option is to stay in the town centre and travel to the Messe each day via the Metro (about five minutes once you’re on and moving). You can get on the U11 at the central station (Essen Hbf) and get off at Messe West/Sud Gruga. Walking is another option, taking just over 30 minutes from the central train station – or up to 45 from some central hotels. Large chain hotels including Ibis, Movenpick and Holiday Inn are all present near the station offering the typical big hotel experience, alongside many smaller, cheaper options. I’ve enjoyed stays in both the Movenpick and Ibis – you simply know what to expect. But my one experience with a small budget hotel did not end well and I’ll avoid that option in future. Hotel breakfasts tend to be continental and overpriced. There are many bakeries in the town centre and I personally prefer to grab something on my way in to the halls each day. Further afield: If you travel to Essen by car, or are on a holiday with non-gaming friends or partners, there are cheaper, more picturesque and more interesting locations to stay if you don’t mind travelling in each day. As mentioned above, Cologne and Dusseldorf are both less than an hour from Essen by rail and have much more to offer in terms of tourism. Essen Spiel is unlike any other big board game convention. Its all about retail, which means the vast majority of space is dedicated to taking your money, with small bits set aside to let you demo new releases. Don’t expect talks, competitions etc. On the plus side, this makes it cheap. It’s only a few euros to get in each day, with a discount available for the whole four days – and additional discounts if you can buy in bulk, so its worth getting a group of you together (even if you make friends outside just to get the tickets). I’ll post prices nearer the time. There is no – I repeat, NO – open gaming areas for you to play inside the Messe. Luckily the local hotels are very amenable to letting gamers use their often vast breakfast areas for gaming. People scuttle home from the Messe with their purchases, hurriedly read the rules over dinner and are in the hotel bars and restaurants playing a while later – and late into the night. It’s actually a really nice part of the experience, once you get used to it. People are friendly and it’s usually easy to find a game, and I personally enjoy the idea of going shopping in the daytime and then playing my new purchases in the evening. All the big central Essen hotels are very amenable (I’ve played into the small hours at the Ibis, Movenpick and Holiday Inn), as are the smaller ones I’ve popped into to meet friends. If you have heard talk of 10+ small halls that are a nightmare to navigate, this is in the past (at least for now). Due to refurbishment of the smaller halls, Essen Spiel currently uses the largest four halls in the Messe which makes it much easier to find your way around. Wednesday to Sunday: When should you go? Thursday and Friday: These are definitely the best days to go if you can travel over to Germany midweek. The halls are quieter, meaning you’ll have a better chance of sitting down at some demos – as well as picking up those hot titles that sell out in the first day or so (it happens every year). Saturday and Sunday: Saturday is the day to avoid if you’re coming for the whole weekend, as people travel in from across Germany and its absolutely manic throughout the day. Sunday morning also tends to be busy, but it thins out a lot in the later afternoon. However don’t expect too many ‘last minute bargain’ rewards for hanging on until the end, as I’ve seen little evidence of it happening. 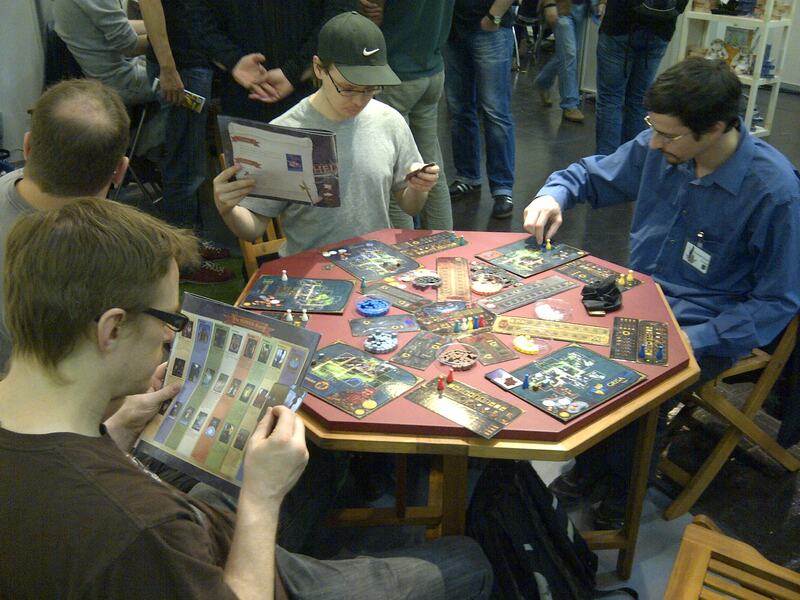 Wednesday: Since 2011 there has been an Essen Warm Up Day organised by Spiele Gilde. It costs 30 euros but is open 10am to 11pm and includes free food and non-alcoholic drinks all day. It’s a great opportunity to extend your stay and get to play some of the new releases a day before heading into Essen Spiel itself, while being easy to get to in the centre of Essen. 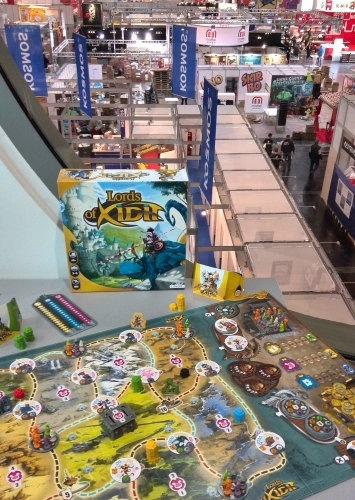 Wednesday is also Essen press conference and manufacturer set-up day, so you’ll find plenty of gaming types in the city on the Wednesday evening – many toting new gaming swag picked up early from the halls. And even if you don’t want to do much after arriving, it’s worth coming on Wednesday just to be able to get into the Messe first thing on Thursday morning. Essen is primarily about new releases, but you’d be amazed at how many companies fail to get enough copies to the show. Much of this is blamed on production issues and shipping, but its not as if those are surprises in the board game industry. Anyway, the point is if you really want something you’re normally best off pre-ordering it. Depending on the size of the manufacturer, pre-orders may be handled through a prepaid service via their website – or via names written on the back of a cigarette packet after sending the designer an email and keeping your fingers crossed. Either way, the best way to find out about them is directly via the website of each game you’re interested in – or more conveniently through Board Game Geek. Each year the site runs an amazingly detailed Essen preview page which lists pretty much every game that’s coming out and any appropriate links. This is the 2014 link to give you an idea of what to expect – I’ll try to remember to come back and update it here when the new one lands (or please remind me nearer the time!). If you are the type who wants to check out every game before you go, another great website is Essen Geek Mini. This takes the Board Game Geek list and lets you rank how interested you are in each game – and then brilliantly plots all the manufacturers onto printable maps, along with your games listed by rank. Geek heaven! Language dependency can be an issue, as you’ll often find different versions in German and English, but also perhaps French, Polish and others. The biggest issue can be differences in pricing – German editions at the show are often cheaper, so it can be easy to grab one by mistake thinking you’re getting a bargain. And you might think there are thousands of copies of a game at the show – when there may only be a very small number in the language you need. Another issues is demos – and how difficult they can be to get. While companies such as Days of Wonder have huge stands demoing a single game, many smaller companies – or those releasing multiple titles – have much less room. You may even find just a single demo table for a game you really want to try (or worse none at all). While some booths will let you book a demo time, many won’t. In these situations you have the choice of waiting for a spot (a bit boring) or hoping for the best (less boring, almost guaranteed to be unproductive in terms of the demo). Your way of dealing with this is up to you – I just want to let you know so you won’t be (as) annoyed and disappointed! While Essen is largely about new titles, you’ll find a good number of secondhand games traders in the halls – as well as large sections dedicated to older discounted titles. These can be brilliant for those of us outside of Germany who only ever see discounts in online stores, and have never seen a living, breathing secondhand board game shop! But do be on your guard for the obvious pitfalls – the big two being missing pieces (for secondhand) and language dependency. If you’re thinking about picking up some titles, do your research and see if they’re language independent – and if so, whether the rules are freely available to download and print. If so, you’re golden. You may find staff on the secondhand stands don’t have great language skills beyond German, while there can be a lot of individual games that are hard to sift through – or behind the counter where you can’t get at them. If there are specific titles/editions you’re after, its well worth printing images of the covers and taking them with you – its the simplest way past any language barriers. I’ve found these stands most useful for older Spiel de Jahres winners, which get massive print runs in Germany when they win the award and many of which are still very popular today. You’ll find piles of old copies of games such as Elfenland, Manhattan, Tikal and Thurn and Taxis for 10-15 euros – all of which are language independent. As well as board games, one of the halls is dedicated to other geek culture habits including comics (ithe Comic Action convention is included in your ticket), RPGs, miniature gaming, CCGs and even a bit of costume/LARPing. But these are squeezed into one hall and very much a small part of the overall show. The food selection is far from brilliant, especially if you’re a healthy type. You should be able to find a beer, a sausage (apparently the currywurst is particularly good – I’ll report back this year!) or a pretzel – with varying degrees of cheese attached – all of which are actually excellent. But I’d suggest a good healthy breakfast pre-con and a proper meal on the way home! I’d also suggest you bring cash (very few stands will accept cards and there aren’t many cash machines inside) and bring water – as well as wearing comfortable shoes. The convention space is massive, you’ll be on your feet a lot, and it can get pretty hot inside. Water and good shoes are essentials. On the plus side, Essen has great tap water so you’re quite safe filling up your bottle from the tap rather than spending a fortune on bottled water. * There are bigger conventions that include some board and card games, but Essen is comfortably the biggest that concentrates almost entirely on the hobby. This entry was posted in Board games, Games, Travel and tagged board games, card game, card games, Essen, Essen 2015, Essen Geek Mini, Essen help, Essen Spiel, Essen travel guide, Essen Warm Up Day, Internationale Spieltage, Messe Essen by Chris Marling. Bookmark the permalink.